These mods are updated to V10 for the 1.19 patch. These mods are updated to V9 for the 1.16 and 1.17 patches. These mods are updated for the 1.15.55 patch. An extra mod is added which uses 3 SimFilter files from the Outdoor Retreat GP. Only use this extra mod if you have Outdoor Retreat installed. The mod is an attempt at dealing with the issue mentioned by Frimlin in the comments concerning more new sims being created than previously; it's not possible for me to see yet in my game if this new mod is helping or not. Everything works fine in the OR maps with this mod installed; the Hermit is in place, and the NPC Bearsuit sim and the Park Rangers are in place, and the Weenie Roast sims show up at the party. This mod is updated to V6 for the January 13th patch. This mod is updated to V5 for the December 16th patch. This mod is remade as V4; one SimFilter file called Bartender_NotBusy is removed from the mod, so this file will function as normal in the game and create a new Bartender sim if/when necessary. V3: This is remade for the Oct.1st update. Two of the Sim Filter files are removed from this version, so there are 36. 'IsFriend' is removed because of the discussion in the comments, but also because there are others like IsSingle, IsEngaged etc. which are not in this mod (I still don't know who these sims are). A sim filter for 'Librarian' is removed to allow for creation of this Librarian; I don't know if they are a true service sim or not, but supposedly they can Mentor other sims in something, although I couldn't make it happen. V2: A new version of this mod uses 38 SimFilter XML tuning files, which are altered to disable the possibility of creation of a brand new sim as an option when the SimFilter system is attempting to send a sim to the venues, or walking down the street past your house, or wherever. 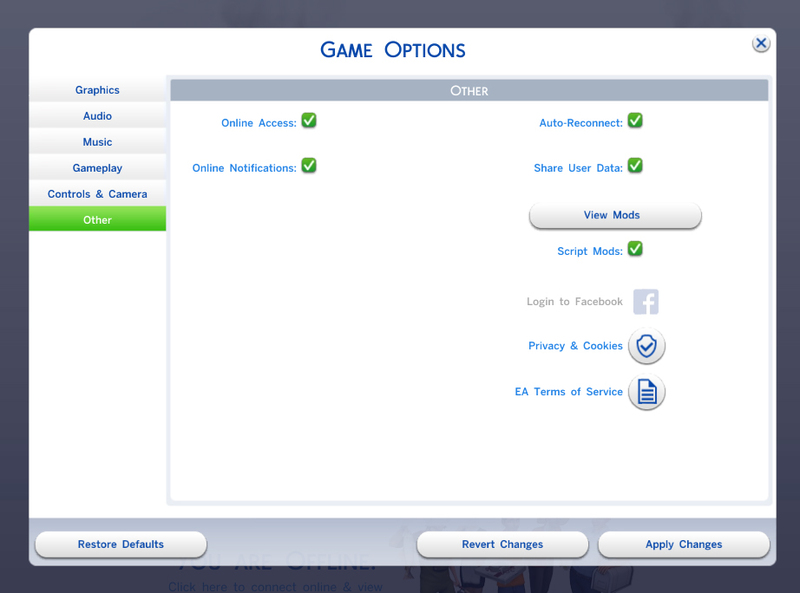 The SimFilter will be required to find a suitable sim among the sims in your game or will send nobody, the spot it is trying to fill will be empty. This may result in seeing fewer of these 'walker' or 'barfly' or 'whatever' sims at certain times, particularly late at night at certain places. An example of this: If your sim is a cheapskate or broke and hasn't bought their own computer so you send them to the Library to skill on the computer there, it appears that the Library has closing hours of 8pm (even though the place is still open), so it will be empty and your sim can study at their leisure without disturbance by others. I haven't done this with intent, this is just the way it works if the SimFilter isn't allowed to create a new sim to send there just because your sim is present. The StoryProgressionSystem XML used previously in this mod isn't in this version, only the 38 SimFilters. I will place a list of these down below later. This mod prevents the constant generating of Homeless Townie households found in the Manage Households window. 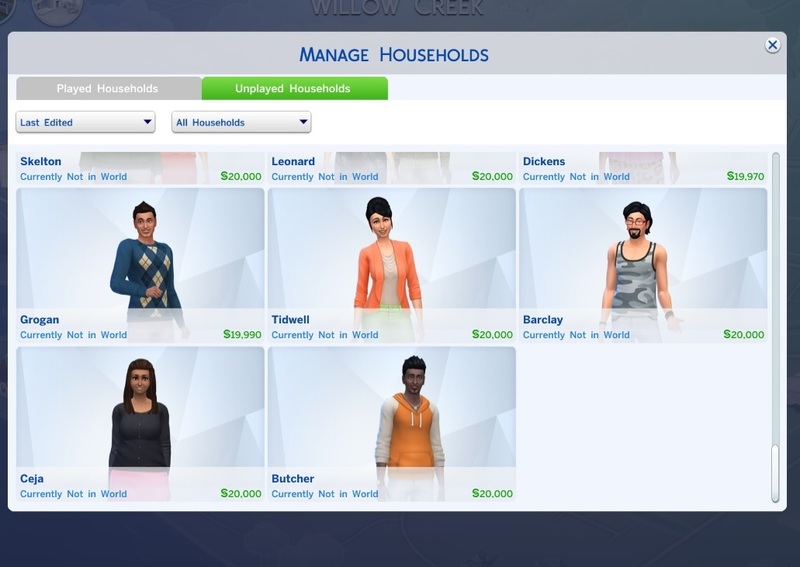 In my game it appears to be stopped completely except for the creation of individual sims who are Service Sims like the Maids, Gardeners for the parks, Pizza Purveyors, the Fishermen and Mailman. In the save game I have tested this on the most, after around 8-12 days have gone by there are 11 individual sims who have been created in total; one each day or sometimes two in one day or whatever. Almost all of these 11 sims I have identified as Service Sims by seeing them in their uniform. The game requires these Service Sims so it is perfectly fine that they are still here. The amount of 11 Service Sims is approximately correct according to my reckoning, plus one Grim Reaper who is always hidden from view in this Window, done with intent by the devs (he is a member of a Homeless Household, yes). My screenshot shows five of these Service Sims, but the screenshot is of course otherwise worthless. Unzip my file and place the .package file in the Mods folder (or a subfolder) the same as other .package files. With the October 1st Update this business below with the unpacked mod folder etc. is no longer necessary, the game reads XML inside .package files normally just like Sims3. When installing this mod a couple extra steps are required if you haven't already done these steps in conjunction with other XML tuning mods. In the resource.cfg file in the Mods folder add the following line after the other text. To do this simply open the .cfg file in Notepad and copy and paste from here into the file and save it. Created with the use of s4pe by Kuree and Sims4Group, and the XML Extractor by velocitygrass; and the Sims 4 XML Extractor by scumbumbo. And plasticbox for informing me that the SimFilters are responsible for much of this nonsense.